As I have mentioned previously, part of my Hunting Wild Yeast project is writeups describing the more common yeast and bacteria that are found in sour beers & wild ferments. In my last article I wrote about the typical pattern of yeasts and bacteria observed in wild ferments. In this article I’m going to cover the basic characteristics, flavour profile, and purification of Brettanomyces yeasts. Brett was discovered by N. Hjelte Claussen in 1904, and was identified as the causative agent in producing the characteristic flavour of old English ales. Brettanomyces is literally Greek for “British fungus”. Of the wild yeasts, Brett is the best known and most widely used. Indeed, Wyeast and White Labs both carry a range of well characterized Brett strains, meaning that at least some Bretts are no longer wild. Brett adds some unusual flavours and aromas to beers. Describing some of these to people who have not worked on farms is difficult – Brett can give off an aroma of an old horse blanket or a sweaty horse; I cannot think of a good replacement, but a musty old wool seater with hints of dust and sweat might be close. Other flavours such as stale/mousey, leather, band-aid/plastic, enteric (vomit), burnt protein/beans, and peppery also describe some of the flavours associated with Brett. To many these sound unpalatable – indeed, in many beers and wines the presence of Brett is a flaw. But managed properly, these yeasts can provide a novel and interesting set of flavours to a beer brewers ensemble. Evolutionarily speaking, Brett is a close relative to our old friend Saccharomyces – indeed, they belong to the same family of yeasts. Brett and Sacch went their separate evolutionary ways around 230 million years ago; despite that they are not overly different. The are roughly the same size and shape, reproduce through budding, are strong fermenters, and can survive in high alcohol environments. But Brett has picked up some unique metabolic tricks over the years, leading to some unique characteristics. The first of these is the ability to ferment a broader range of sugars than normal yeast – indeed, Brett can consume some of the sugar-based polymers found in wood, which is what allows Brett to inoculate wine barrels and corks – leading to the cork taint feared by many vintners. This same capacity allows Brett to consume many of the dextrins that Sacch will leave in a beer. As such, Brett beers often have very low final gravities – in some cases below 1.000. Because of this, Brett is rarely used in low-alcohol beers, as it leaves the beer thin and insipid. Generally, Brett is limited to beers with a gravity above 1.060, with the exception of Lambics and Berliner Weisse. Because Brett will digest most dextrins, higher gravity beers become winelike (vinous) and dry. Aside from the ability to eat a much broader range of carbohydrates than Sacch, Brett also produces many unique flavour compounds. 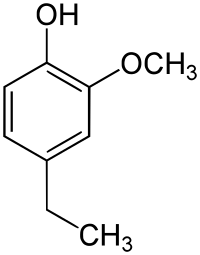 The most desired/common are phenol compounds – these include 4-ethylphenol (barnyard/horse blanket; band-aid), 4-vinylphenol (mousey/barnyard) and 4-ethylguaiacol (spicy/peppery, cloves, smoke). Brett also produces some fatty-acid derived compounds including isovaleric acid (rancid/cheese), isobutyric (buttery) and 2-methylbutyric acid (sweaty/cheesy). In the presence of oxygen – even small amounts – Brett will produce acetic acid (vinegar), providing an acidic finish to the beer. The contribution of Brett to acidity is usually small; very sour beers gain their acidity from the activity of bacteria such as lactobacillus. B. bruxellensis: Predominantly used for secondary fermentation, brux produces a medium Brett character. This is one of the more commonly used strains commercially, and is found in beers such as Orval and other trappist beers. B. lambicus: As its name suggests, this yeast is common in lambics. It produces an intense Brett character often defined as spicy, clovy and smoky. B. anomalus/claussennii: This is the least intense of the Bretts, and is the yeast most often associated with “stale” British ales. Its profile is dominated by fruit – pineapple aroma is often described. Brettanomyces can be purified and identified relatively easily. Because Brettanomyces is one of the only yeast strains aside from Saccharomyces which survives well late into a wild ferment, it can often be purified (along with Sacch) from the dregs of a wild ferment. Separating Brett from Sacch is easy – Brett is resistant to cyclohexamide (it kills Sacch) and Brett can break down the dye bromocresol green. As such, purifying Brett need be no more complex than plating dregs on YPD or wort-agar containing bromocresol green – Brett colonies will be white-to-yellow in colour; Sacch will be blue/green. Any surviving bacteria will also grow, so colonies need to be further characterized. The addition of cycloheximide to the plates will ensure that only Brett and bacteria grow.